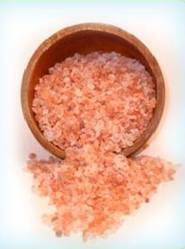 When consumed in moderation, good sea or Himalayan salt provides trace minerals - which are missing in many chronic disorders, including cardiovascular disease. Both studies found that salt restriction produced only minor reductions in blood pressure (on average), with a somewhat stronger effect in those with high blood pressure. Processed table salt is an unnatural chemical form of salt - Excessive drying heat (>1200ÂºF) alters natural chemical structure of the salt.“Chemically cleaned”table salt is 97.5% sodium chloride (devoid of trace minerals) and the other 2.5% is iodine and chemicals E.g moisture absorbents, such as calcium carbonate, magnesium carbonate, and aluminum hydroxide. (Aluminum deposits into your brain -potentially a cause of Alzheimer's disease). Average person consumes an excessive daily 4-6 grams, some as much as 10 grams -processed table salt is found in almost all processed foods and also added at the table. Excess Salt depletes body's cellular water - water molecules must surround the sodium chloride to break them up into sodium and chloride ions in order to help neutralize them. This takes water from your cells. Your body uses 23 times the amount of cell water to neutralize every gram of sodium chloride that your body cannot get rid of. This causes excess fluid in your body tissue, which can contribute to cellulite, rheumatism, arthritis, gout, and kidney / gall bladder stones. - Has Perfect crystalline structure (as seen under an electron microscope) - the interconnectedness of each molecule provides a harmonious vibrational energy component of the 84 elements present. The picture on the left (below) shows refined sea-salt. The natural Himalayan salt shown on the right clearly has a more structured crystalline form. - Contains all of the 84 elements found in the body - the same elements originally found in the “primal sea”, all in colloidal form (small enough for your cells to readily absorb them). 1. Regulates water content throughout the body. 2. Promotes healthy pH balance inbody's cells - particularly brain cells. 3. Promotesblood sugarbalance and help reducethe signs ofaging. 4. Assists in the generation of hydroelectric energy in body's cells. 5. Absorbs food particles through your intestinal tract. 10. Regulates sleep - it naturally promotes sleep. 13. Essential for the regulation of blood pressure - in conjunction with water. Unrefined salt also has health benefits when applied to the body - use a 1% solution (the same concentration as found in tears and amniotic fluid). For comparison, the sea is a 3½% concentration. - Salt Bath - Use 2¼pounds in a normal sized tub. Body absorbs minerals through the skin. Also rejuvenates your skin. - Apply a 1% solution to rashes, insect bites - amazing, simple, effective and cheap remedy; also rejuvenates the skin. You gotta love their names! - How about Technetium, Gadolinium and tantalum! ?